Posted on November 23, 2016 , in Hot Tubs. If you’re getting ready to buy a hot tub, its size should be a major consideration. Because your current needs and your future needs may differ, there are many things to think about to help you determine the perfect size. Below, you’ll learn what kinds of considerations you should make to choose the right-sized hot tub that will meet your needs now and in the future. Knowing how much space you have for the hot tub should be your first step in determining what size to choose. You should measure your patio, deck, or area where you’ll install the hot tub and take these measurements to your dealer so they can show you hot tubs that are a good size for your space. The size of your hot tub will be heavily informed by whether you install it indoors or outdoors. Smaller hot tubs usually work best in indoor spaces unless you’ll put it in a large solarium or other large area. Outdoor installation provides you with a wide range of size choices, depending on where you’ll install it. Take tally of how many people will regularly use your hot tub. This will ensure that you choose a size that will keep everyone comfortable. If you frequently entertain or have family over, make sure you include them in your numbers. 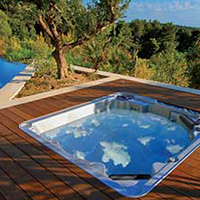 Larger hot tubs are typically the best options for hot tub owners who frequently entertain. Consider choosing a larger hot tub that can fit all of your guests comfortably. When deciding what size of hot tub to invest in, thinking about how large your family is now, as well as how large it may be in the future, is important. Even if you don’t have a family now, if you plan to have one in the future that should be a consideration. With proper supervision, hot tubs are very safe for kids and can be a great place for families to connect. With these tips, you’ll be sure to choose the best size of hot tub for your needs. Remember that if you need help, your dealer is a great resource!